Summary: EPISCIA (e-pish’-i-ah) – A genus trailing greenhouse plants from Tropical America, related to the African violet family – Gesneria. Small, showy, often hairy leaves with small white, red or purple flowers. A favorite for hanging-baskets. Propagation by division and cuttings. Question: Please tell me something about the red violets (species of episcia)- how to water, how to start slips and what conditions they need. 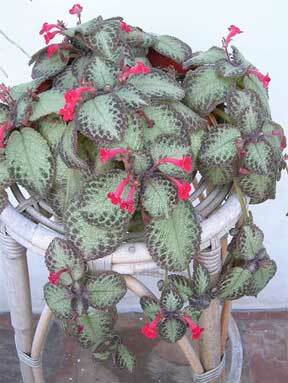 Answer: The word episcia means shade-loving. The plant is closely related to the African violet and gloxinia and it responds to the same culture. The episcia needs no rest period and prefers a warm humid atmosphere. It produces stolons like a strawberry. These may be inserted into a neighboring pot of moist soil while they are still attached to the parent plant. After a few weeks the stolon will have formed roots of its own and may then be clipped from the parent. Plant episcias in porous, light, rich soil and water them regularly. Question: Why do the buds of my flame violet dry up and fall off ? Answer: Episcia reptans (formerly called Episcia coccinea and fulgida; sometimes “flame violet”) likes to grow in a warm, humid place. Indoors we have flowered episcias in windows facing all directions with a humidity range of 40 to 60 per cent. Temperatures below 60 degrees are uncomfortable for episcias. Try to provide more humidity by grouping several plants together, preferably on a tray of moist sand or pebbles. The dry heat of many rooms is the hardest indoor gardening problem to solve. There are two windows in most dwellings which are likely to be more humid than others: the window above the kitchen sink, and the one above the bathtub. Answer: It is best to transplant the leaf to loose, spongy soil as soon as it forms roots. Turn a drinking glass over it for a few days to help it become established in the soil. When new plants push through the soil and make enough growth to crowd, tap the soil from the pot, and with your fingers gently separate each young plant and pot individually. Question: I have been fighting mealybugs on my sultanas and African violets with rubbing alcohol on a toothpick. This takes such a long time and doesn’t seem to get them all, so I am wondering- if I can use Volck spray. Would the oily base ruin the violets? Answer: Volck or any other oil spray will likely ruin the violets. However, a regular spray program with a spray such as neem oil will keep the mealybugs under control. Question: Would you suggest a good soil mixture for gloxinias? Answer: Gloxinias thrive on a soil that is light, loose and fibrous, but rich. Here is a good mixture: one part each of good garden loam, clean, sharp sand, peat moss and compost. Reputable commercial mixtures of African violet soil sold in department and garden supply stores usually grow good gloxinias.